Selling products or services internationally is becoming an integral aspect of a sales strategy for many companies. Strangely, only 1% of US companies have decided to sell products overseas, which means there is much-untapped business potential for all businesses, regardless of size. 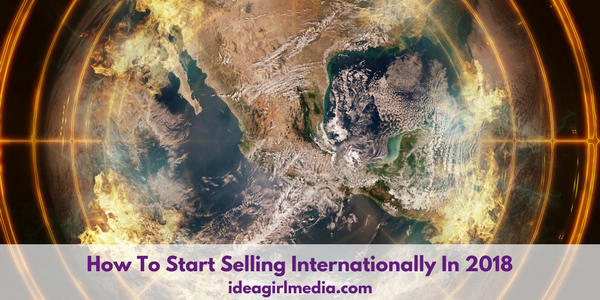 If you are thinking of selling your goods or services overseas, find out how to start selling internationally in 2018 and beyond. The first step you will need to take is to identify the country or region you plan to market and sell your products or services. Your choice will more than likely be determined by culture, economics, politics, and the market risk. In addition, you will need to identify if there is a customer demand for your goods. Aim to collect the data via telephone interviews with prospective customers and government representatives. Have you thought about how you will connect with your target market? For example, if you are running a B2B company, you will want to make cheap international calls to communicate with your overseas clients. In turn, if you want to build a professional relationship with a client in New Delhi or Mumbai, you might consider Viber rates India. Improve your success when selling overseas by developing an export plan that outlines information regarding your business goals, financial plans for expansion, and how you intend to market and sell your products or services abroad to your target market. Will you introduce an international sales teams? Will you produce specific marketing campaigns for your target destination? Will you need financial investment to make your international goals a reality? If you are currently running a business, you more than likely already have a website up and running. Fortunately, it can be easy to adapt your website to an international audience. A talented web designer and SEO manager will have the knowledge and skills to promote your existing site to overseas customers, so they can shop on your website just like your domestic customers. However, you will need to identify the best overseas shipping processes, and you’ll need to learn more about foreign taxes, duties, and custom laws. It might also be helpful to introduce third-party payment systems, such as PayPal, to securely accept different currencies. Also, consider offering translation services on your website when marketing to a new foreign market. There are many fantastic translation software tools on the market. Alternately, you could employ a translator to write content for your website, social media posts, and marketing materials. Many companies eventually consider opportunities for selling internationally. Following the steps above will help your business successfully prepare. Do you have any expert advice on how to sell goods and services overseas? Write a comment below to share your tips. It is true that a well-educated human will bring better translation results than the average software. 7:31 AM I have read your blog its really good and awesome. I want to ask which company is providing legal Document Translation services? As I have worked with international people in my previous career, I have a group of trusted sources I work with personally for my business. For others, we let them find their own resources, but do recommend options if asked.